The medieval Western world was a religious one. Most people attended church, went on pilgrimages, prayed and took part in religious processions. A strong piety existed, with the ever-present need to ask for God’s blessing and protection. 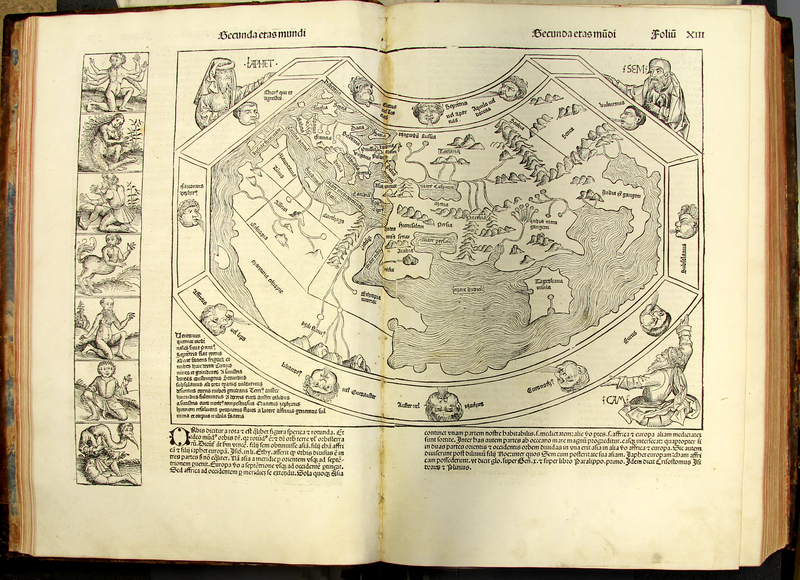 This image is from Schedel’s famous Nuremberg Chronicle and was based on a Ptolemaic map of 1482. This ‘Second Age of the World’ contains Asia, Europe and Africa and places such as the Canaries (Isles of the Blessed), Scotia (Scotland), Scythia, and Hibernia (Ireland). It reinforced to readers the biblical tradition that all humankind was descended from Noah’s three sons: Shem, Ham, and Japheth. Despite Schedel’s attempt to dispel superstitious myths, the weird and wonderful remained: the ‘naked and hairy men who linger in rivers’ and ‘Apothami, who spend time in the water and are half man, half horse’. A huge success in its time, the Chronicle today bears witness to the intellectual climate in Europe about 1500. [Hartmann Schedel], “[Nuremberg Chronicle],” ourheritage.ac.nz | OUR Heritage, accessed April 26, 2019, http://ourheritage.ac.nz/items/show/10322.